The Hospice in the Hospital is a six bedded hospice within Grantham and District General Hospital. The Hospice in a Hospital is a unique partnership between United Lincolnshire Hospitals Trust, South West Lincolnshire Clinical Commissioning Group and St Barnabas Hospice. This partnership enables us to bring together expertise to support and care for our patients in the south of the county. 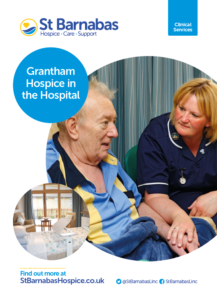 To download our patient information on the Hospice in the Hospital Grantham service simply click the image below or here. As a patient you may come into the Inpatient ward for different reasons; you may need help to control pain or symptoms, or for care at the end of life. Referral to the Inpatient ward is by a healthcare professional such as your GP, community nurse, specialist nurse or hospital doctor. This is different from patient to patient and St Barnabas is not a long stay unit. The usual length of stay for most patients is not more than two weeks. The ward has six single rooms with en-suite facilities and access to the landscaped courtyard. During your stay nurses, health care support workers, physiotherapists, occupational therapists, doctors and other healthcare professionals will care for you. Please bring with you all the medicines that you are currently taking, including any over the counter medicine or alternative therapies. Electrical equipment – health and safety regulation requires the Trust to test all electrical equipment before use. This includes laptops, hand held games consoles, radios etc. Please speak to a member of staff who will organise this on your admission. There are no facilities for laundering clothes, so please ask your visitors to do this for you. Please do not bring valuables or large sums of money with you. We regret that we cannot accept responsibility for money or valuables that are not handed in for safekeeping. Smoking is not permitted in any United Lincolnshire Hospitals Trust facility. Whilst smoking is not encouraged, patients and visitors may smoke in the garden, but we request you do not use the patio areas because it is too close to patient areas. The Hospice in the Hospital has an open visiting policy which means that friends and family are able to visit you at any time. Yes, visitors are able to stay overnight if your condition deteriorates. There is a relative’s room with a bed, and recliner chairs if you would rather they stay by the your bedside. Your visitors can stay overnight by discussing it with the nurse in charge. There are a limited number of car park spaces for patients and relatives right outside the entrance to the Hospice in the Hospital. If these spaces are full then please park in the main car park. In both cases, you must get a parking pass from the Hospice reception so that you do not have to pay the cost of parking. My mum got married in the hospice it was the most precious day, the staff were amazing and helped plan everything with only a few hours’ notice! They are amazing! Without the support of people like you, St Barnabas Hospice would not be able to provide the services that our patients need. Thank you for your generosity. As someone who has supported St Barnabas Hospice before we would like to keep in touch with you in a variety of ways. If you are happy for us to keep in touch by email or text please tick the boxes below and complete your email address and mobile phone number.